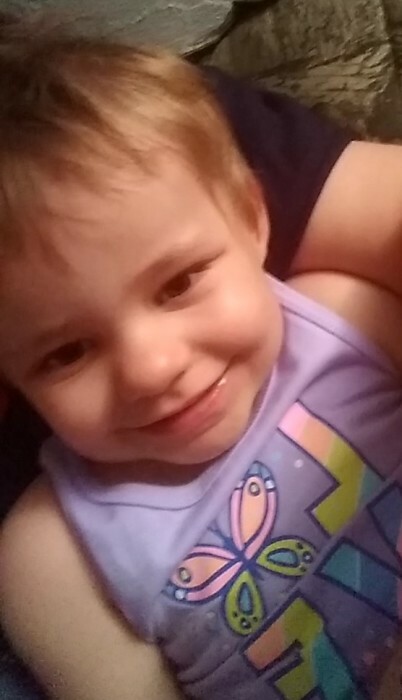 Sophia Jade Ernst-Kucsera, age 3 years, passed away Tuesday, September 4, 2018 in Almena Township. Sophia was born May 27, 2015 in Kalamazoo, Michigan the daughter of Corey Kucsera and Tasha Ernst. She was a very happy child; her laughter was infectious. Sophia loved to dance and sing and collect rocks. Her favorite movie was Mohana & Trolls. Sophia also loved playing with her cat, her kitchen set and her swing; but most of all she loved playing with her brother, Andrew. Sophia will be dearly missed by her entire family. Sophia is survived by her loving mother; Tasha, her brother Andrew Ernst-Kucsera, maternal grandparents; Keith and Cynthia Ernst, paternal grandparents; Tim and Janice Kucsera, great-grandparents; Diane and Jack Lewandowski, aunts and uncles; Mitchell and Gloryanna Kucsera, Christopher Houghton, Faith and Charles Ernst and Justin and Katrina Ernst and several cousins.